I realize it's been a long while since I've posted and I have no good reason for not keeping up with it. I have most certainly been cooking away and trying new things. I have been making particularly yummy things with my new KitchenAid Stand Mixer. First, before I go into the details of how much I love (literally, l-o-v-e) my new mixer, I should say that if you do not have one, get one. Put it on your Christmas wish list, ask for it as your anniversary present, heck, go buy it for yourself. You will not regret it. I had my heart set on the mixer for awhile and I think I used it three times on the first day I had it. My friend once, let's say 'questioned' rather than 'criticized', my use of the mixer on Thanksgiving day to whip my potatoes rather than just use a plain, old masher. Well. Why wouldn't I? They were scrumptious garlicky-herby clouds of yum. I truly use it for so much more than just mixing cakes and whipping soft peaks into whites. No, I use it to whip up a quick batch of pancakes for my sleepy husband on a Sunday. I use it to mash up those back-of-the-fridge avocados that have just been waiting to become gaucamole. I have made countless dozens of banana muffins for the freezer, or to keep the kids occupied while the girls chat over brunch. I've brought back a friend's long-forgotten childhood favorite: yorkshire pudding. I don't even need to go into the cookies galore that have been made. And did I mention I prepped a wicked meatloaf in about 5 minutes flat? But one thing that I was pleasantly surprised to see come out of my beautiful new mixer, was a recipe that I borrowed from another blog. I made "buckeyes" from the Smitten Kitchen blog and they were fabulous! The recipe, however, made about a million little balls of deliciousness; I took them to work, I gave them to family, I tucked some away in the fridge, and I still had enough to feed a small army. 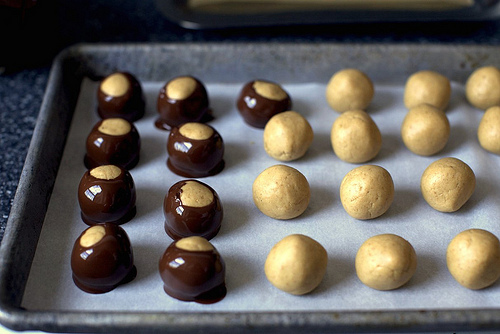 They are sweet, tiny balls of homemade-peanuty-goodness but they aren't for the faint of heart when it comes to sugar. I didn't have any cream cheese so I substituted eggnog, which, in hindsight, may not have been the best substitution since I had to more, yes MORE, sugar. But they turned out just as yummy as hoped. And now that it's the holiday season, I can't wait to make my Grandma's shortbread and a newfound addiction; rum cake. Mmmmm. So, as I said. Go get yourself the one thing that is not only going to revolutionize your kitchen, but your life!